Welcome to Bundala,the world at the edge where the land, the sea, and the wetlands meet. 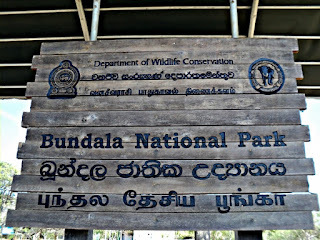 Bundala National Park is located 251 km southeast of Colombo, close to the City of Hambantota in the Southern Province of Sri Lanka. An area of 6216 hectares is one of the 3 "RAMSAR"approved Wetland Reserves in Sri Lanka (the other two are Annaiwilandawa beyond Chilaw and Madhu Ganga Reserve at Balapitiya) that hosts over 20,000 shorebirds, during the period August to April. The Park consists of lagoons and inter-tidal mud flats where wintering birds rest and feed, golden sandy beaches and sand dunes where sea turtles nest and the thorny scrub-land where elephant, spotted deer, wild buffalo, wild boar, crocodiles and peacocks roam. More than 150 species (including 45 species of "Waders") of resident and migrant birds could be seen in this Park. Thousands of Greater / Lesser Flamingoes, Spot-billed Pelicans, Spoonbills, Ducks, Indian Shags, Cormorants, Stone Plover and various species of Herons are among the large flocks found here. Pathirajawela, within the Bundala National Park, is a site where the earliest evidence of the pre-historic man is found in the Island. Bundala was designated a National Park on 4 January 1993 (Gazette Notification No. 748/3), having originally been declared a Sanctuary on 5 December 1969 (Gazette Notification No. 14,883). It was designated a Wetland of International Importance at the time of Sri Lanka’s ratification of the Ramsar Convention on 15 October 1990. 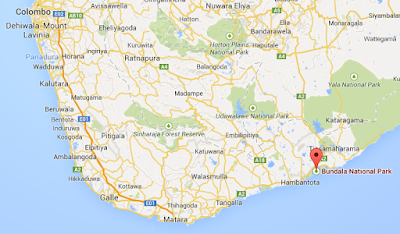 Bundala lies on the coast in Hambantota District, South Province and can be accessed from the A2 highway, just east of the town of Hambantota. Its total area is 6,216 ha. The northern boundary of the National Park abuts Wilmenna Sanctuary, more recently established in June 2006 and 3,333 ha in extent. Getting there : From the A2 , at the Weligatta junction, near the 251 Km post, take the turn to Bundala Village. The park office and entrance is on this road. 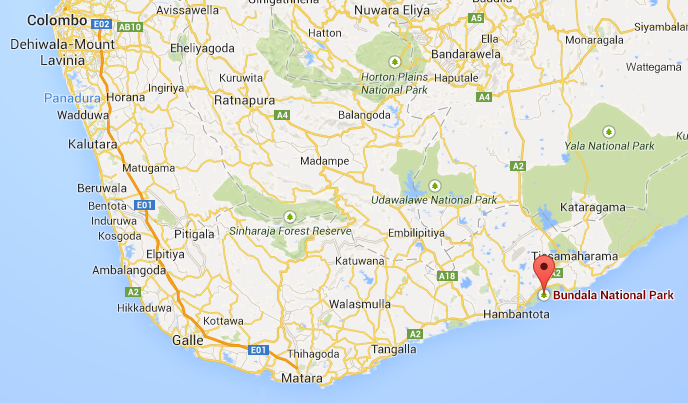 Accomadation : Tissamaharama has a range of accommodation. the accommodation near Yala National park is within an hour's drive.also can find small village of Kirinda. The general climate of Bundala National Park is hot and dry. While the average Temperature is 27 degrees Celsius, the annual rainfall varies between 900mm to 1300mm. Dry season’ falls between May and September.Best time to visit is September to March: during this period migratory birds arrive at the park. Three topographic zones, ranging in elevation from sea level to 20 m, can be distinguished at Bundala: beach and sand dunes, outer coastal plains with lagoons and inner coastal plains (Figure 2.1a). There are five shallow, brackish lagoons, of which three have been converted into salt pans. These lagoons are described in more detail in Section 8.1. Geologically, Bundala lies within the Vijayan complex, represented by a variety of gneisses and granites . The coastal belt contains a thin band of Ferruginous Gravels deposited in the Quaternary period, above which are some detached Red Earths. The land between Bundala Lewaya (lagoon) and the inner coastal plains consists of fossil shell deposits originating from the Miocene and post-Miocene. Soils near the shore are Red Earths and sandy Regosols. Alluvial soils are found along the Kirindi Oya and in low-lying areas . Bundala lies in the Dry Zone. Mean annual rainfall ranges from 900 mm to 1300 mm, with two peaks periods of rainfall in April–May and October-November, and an extensive intervening dry period between May and September. Mean annual temperature is about 27 0 C. Relative Humidity ranges between 76% and 81%. Wind speeds may reach 23 km/hour during the South-West and North-East monsoons. 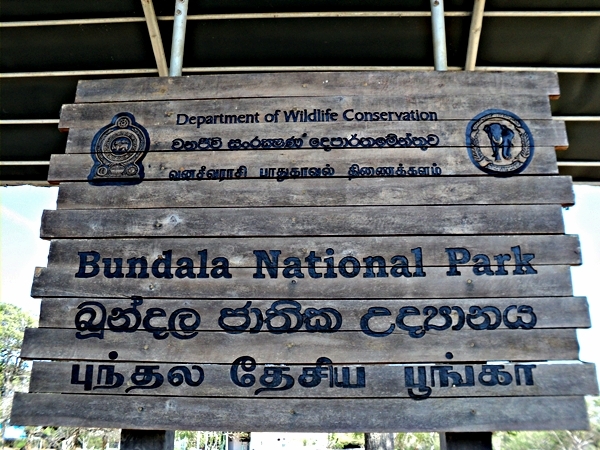 Bundala’s value as a wetland of international importance for the conservation of birds, especially migrant species, has been known for many years and led to its declaration as Sri Lanka’s first Ramsar site in 1990. This continues to be the case as shown by the results of Survey, in which approximately 50% of Sri Lanka’s migrant bird species were recorded at Bundala. Approximately 50% of birds recorded in Survey are aquatic species or aquatic associates, indicating that Bundala remains one of the important sites for aquatic birds in Sri Lanka, especially winter visitors of which a number of species are rare, such as Small Pratincole (Glareola lactea), Dunlin (Calidris alpine) and Ruff (Philomacus pugnax). Of Sri Lanka’s 220 breeding resident species, 55% were recorded in the National Park and Sanctuary, indicating the value of these two adjacent areas for long-term conservation of indigenous bird specie. The level of endemism is low compared with other protected areas in the Wet Zone. diversity within habitats and drainage units Species richness and diversity indices are shown in Table 9.1 for all terrestrial taxonomic groups within the five habitats surveyed at Bundala National Park and the adjacent Wilmenna Sanctuary. Species richness is highest for plants, reptiles and birds in Scrub (the most frequently sampled habitat7 ), for amphibians in both Dry-Mixed Evergreen Forest and Grassland and for mammals species richness is highest in Grassland. Dry-Mixed Evergreen Forest has the highest species diversity for amphibians, Scrub for plants and reptiles, Grassland for birds and Sand Dunes for mammals. These data reflect the highly variable responses of terrestrial taxonomic groups to the different habitats. Perched sententiously amidst the upper branches of the park's innumerable skeletal palu tees are the peacocks. A memorable site. Depending on how wet it, your tracker might let you get within a couple of meters of their log-like forms, or even take you to have a peek inside this burros; a memorable experience, though not one for the faint-hearted. Between October & January four of Sri Lanka's marine turtle (olive ridley, green, leatherback & loggerhead) lay their eggs on the coast of the park. Through this website we invite you to take a glimpse of Sri Lanka, which is not only the lustrous Pearl of the Indian Ocean, but one of the most exciting locations for your next tour, vacation.